Congress reauthorized the Export-Import Bank in 2015, but since then the bank has faced limitations on its operations and is not fully staffed. Reauthorization will lapse in September 2019. Due to the operational and staffing constraints, U.S. export credit volumes are well below 2015 levels and are a small fraction of those issued by international official export credit agencies. Looking forward, policymakers need not only to reauthorize the Ex-Im Bank, but also to remove the constraints on its ability to improve the international economic competitiveness of American exports. The Export-Import Bank (Ex-Im Bank) is the official export credit agency (ECA) of the United States. To that end, the Ex-Im Bank provides loans, guarantees, and other modes of financial assistance to help facilitate the export of American goods and services. American Action Forum (AAF) writers have commented extensively on the Ex-Im Bank in the past. For an in-depth review of the Ex-Im Bank, please review AAF’s major research performed in 2014. In light of the September 2019 deadline to reauthorize the Ex-Im Bank, an update to that analysis further illuminates the key role the bank plays. In 2015 Congress re-authorized the Ex-Im Bank until September 2019, but in doing so it placed significant limitations on the ability of the bank to act. The program is limited to $1 billion per contract or other arrangement and capped at $10 billion per year. To put this limitation in a broader context, in 2017 the United States exported $1.4 trillion in goods and services. The United States is the world’s third-largest exporter, topped only by China and the entirety of the European Union. It seems internally inconsistent to reauthorize the Ex-Im Bank, but then provide less than $5 billion to support U.S. exports – the de facto equivalent of not reauthorizing the bank at all. This limit is not the only constraint. The Ex-Im Bank is unable to approve any transactions greater than $10 million in value since it lacks a quorum of three voting board members, a position it has remained in since 2015. In contrast, other ECAs, most notably the United Kingdom’s UKEF, do not operate with minimum or maximum contract or loan values. The Ex-Im Bank currently has four vacant board positions and has only one voting member, Jeffrey Gerrish, who acts as both chairman and president, as well as two ex officio non-voting members, Commerce Secretary Wilbur Ross and U.S. Trade Representative Robert Lighthizer. President Trump has nominated individuals to serve on the Ex-Im Bank’s Board of Directors, yet they await confirmation in the Senate. Given the lack of a quorum, as of Summer 2018, there is $43 billion in transactions awaiting approval that Ex-Im estimates could support 250,000 U.S. jobs. The Ex-Im Bank offers three financial products: direct loans, loan and working capital guarantees, and export credit insurance. All obligations carry the full faith and credit of the U.S. government. 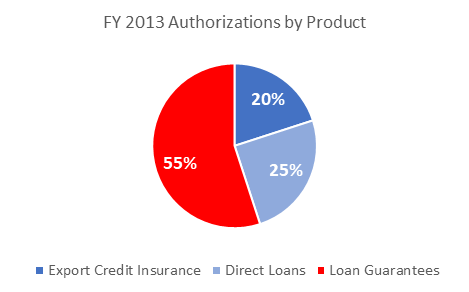 In 2013 fixed-rate direct loans made up one-fourth of authorizations by dollar amount in FY 2013. These fixed-rate loans are offered directly to foreign buyers of American exports and typically cover up to 85 percent of the contract value. 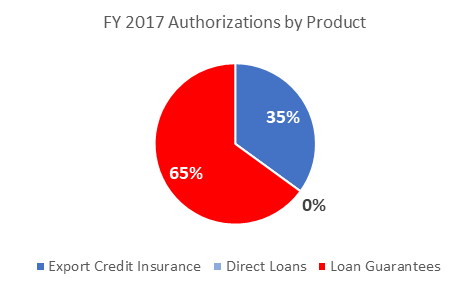 By comparison, in 2017 direct loans constituted a statistically negligible proportion of Ex-Im Bank authorizations by product. Direct loans are one of the most powerful tools available to the Ex-Im Bank, providing foreign credit-worthy international buyers with inexpensive term financing that may not otherwise have been available. Despite its name, the Ex-Im Bank now functions almost entirely as an insurer. 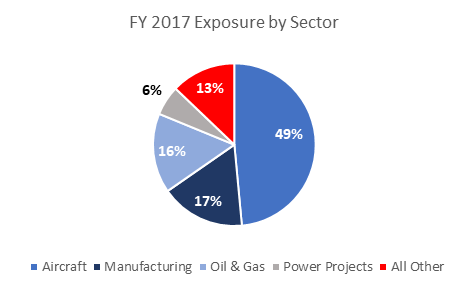 This necessarily decreases its ability to support American manufacturers in those targeted circumstances when private markets are unable to support the financing projects. As can be seen above, since 2014 there has been some shift in the mandated programs that the Ex-Im Bank has pursued, most notably dropping an explicit Minority & Women Owned platform. 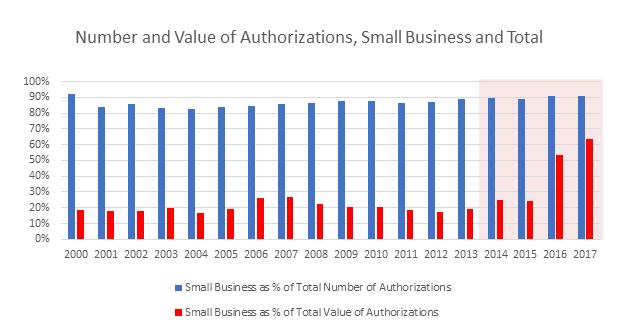 Perhaps the most striking changes, however, can be seen in the increased proportion of authorizations supporting small businesses. One of the major criticisms of the Ex-Im Bank is that in the past financing has largely supported a few industry titans. As can be seen above, although the total value of authorizations has vastly decreased, authorizations to small businesses now for the first time make up over 50 percent of the total. That said, in raw figures the actual financial support lent to small businesses is less than half the support provided in 2013, when small business made up only 19 percent of the total value of authorizations. 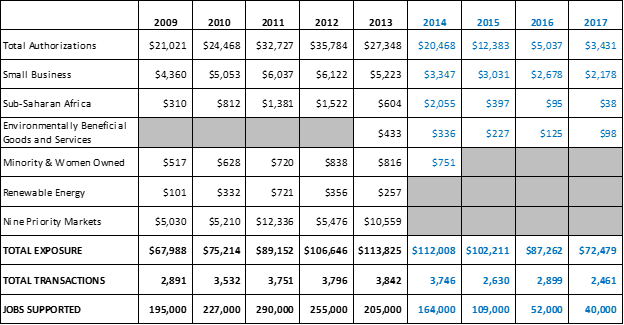 Little has changed, however, in the Ex-Im Bank’s exposure portfolio. Although viewing the changes of the last year by relation to the Ex-Im Bank itself are illuminating, there is more value in comparing the Ex-Im Bank to the performance of other international ECAs. More than 60 countries outside the United States have ECAs. AAF has written at length on the role of the Ex-Im Bank as a necessary evil. The argument is simple: Although ECAs can be misused to provide excess subsidies toward mercantilist ends, until the rest of the world shutters their ECAS, the United States should continue the Ex-Im Bank in order to support the competitiveness of U.S. exporters. As can be seen above, although global trends over the last four years indicate a decrease in reliance on ECA export credit, the trend appears to be reversing, most notably in China and the BRICs more generally. Setting aside these increases, however, by sheer volume other countries dwarf U.S. credit support, with China funneling $40 billion to support Chinese industries. Firms face risks and challenges when engaging in exports, and the Ex-Im Bank has been an important tool in helping U.S. corporations compete overseas. Beyond being important for the U.S. economy on the international stage, the Ex-Im Bank’s work benefits more than just the corporations directly involved in export sales. Implicit in Ex-Im Bank financing is an economic transaction that involves and benefits the seller, but also its workers, suppliers, and equity investors. A truly free market would rely on private export financing. Regrettably, most developed countries support their export industries. The Ex-Im Bank is therefore a necessity – and if it is a necessity, then it is in U.S. interests to make it as effective as possible. The Ex-Im Bank is certainly in need of reform. AAF has called for these in the past, and the case remains the same. Congress should seek the elimination of unneeded taxpayer backing and financing authority, the elimination of preferential and quota approaches to industries and firms, an increase in transparency, and improvements in how the bank selects projects to finance. More pressing, however, is the need to staff and fund the Ex-Im Bank appropriately. It has been hobbled without a quorum on its board, and recent reform efforts have vastly decreased its ability to operate. The current mandate expires in September 2019, and, if 2015 is any indication, re-authorization will once again be a contentious political issue. 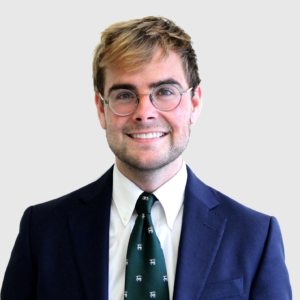 Thomas Wade is the Director of Financial Services Policy at the American Action Forum.